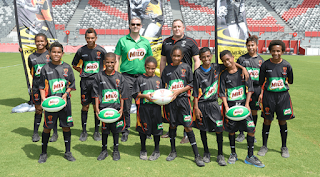 Milo has had a long association with rugby league in PNG, where it supports the League Bilong Laif (League for Life) program, which uses rugby league-themed educational and reading materials to encourage healthy lifestyles and promote education. Milo will activate fan engagement initiatives in official precinct areas during the tournament. Rohan Sawyer, General Manager Commercial and Marketing RLWC2017, said: “It is great to see Milo’s continued support of rugby league in Papua New Guinea through this partnership with the Rugby League World Cup 2017. In the lead-up to RLWC2017, Milo will utilise their national retail network in PNG to give local residents the chance to win one of 30 VIP packages* for two including flights, accommodation and tickets to one of the three games to be played at Oil Search National Football Stadium. Rugby league is the national sport of PNG and the country was announced as a “Hosting Partner” of RLWC2017, alongside co-hosts Australia and New Zealand, in 2015. PNG will host the Kumuls’ three pool matches against Wales (28 November), Ireland (5 November) and the USA (12 November) at the Oil Search National Football Stadium in Port Moresby.